Tuesday, August 15, 1911: Went to Watsontown this afternoon to get some nick-knacks to take to the picnic. Makes me to mad Carrie isn’t going after all our planning. I have a presentiment that perhaps no one will be there except its originator, but the morrow alone can tell. What could nick-knacks for a picnic have been? . . . Crepe paper? . . . paper nut cups? Neither of these items seems exactly like a nick-knack or right for a picnic, and they may not have even existed a hundred years ago. Why isn’t Grandma’s friend Carrie Stout going to come? Carrie had been involved in the planning since the very beginning. Did Grandma and Carrie have a disagreement? Was Carrie grounded for some reason? I wonder if Grandma had begun to makes foods for the picnic. An excellent old-time food for a picnic in August is Cucumbers and Onions. Stir together the vinegar, sugar, and water in a large bowl. Add cucumber and onion; gently stir to coat vegetables with liquid. Cover and refrigerate for 24 hours before serving. 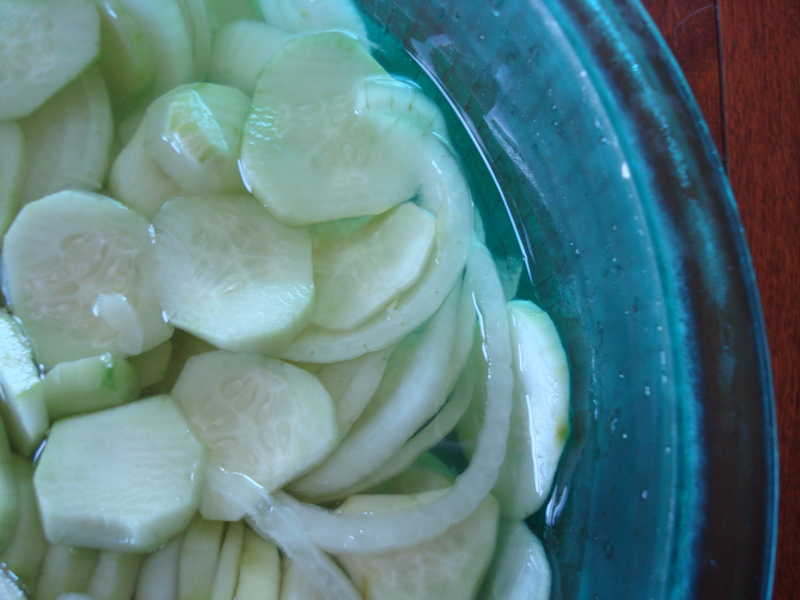 It is okay if there is a layer or so of the sliced cucumbers and onions above the liquid because after a few hours the amount of liquid will increase as some of the liquid comes out of the vegetables. Posted on August 15, 2011 August 30, 2015 by SherylPosted in Food, recipesTagged cucumbers, onions, salads. Next Next post: Picnic Was a Success! Thanks for including the link to your blog on the New York Times’ comments section today (re: Tamara Adler). thanks for sharing your blog on there! I second C.E. Harley’s reply, and look forward to reading your grandmother’s diary. She would have been slightly older than my own grandmother, so perhaps I’ll get a glimpse of what her life was like. Thanks for including this on the NY Times comment section. That’s how I found it as well. Thanks for stopping by. It’s always wonderful to hear when people enjoy this blog. Lol, yes, finally a useful link included in the NYT comments section. Sounds like a fascinating blog, I can’t wait to read it! Found your blog through your comment on NYT. In Barbados, this pickle is called “souse” and the onion and cucumbers are eaten with pigs’ feet. Thanks for stopping by. It’s interesting how foods have different names and complementary foods in different regions.